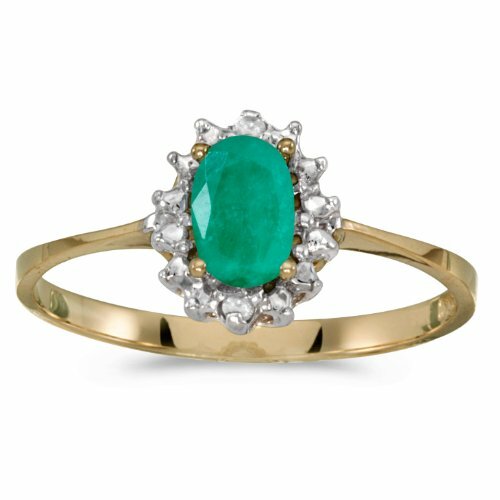 Enhance any wardrobe with this beautiful oval emerald and diamond ring. 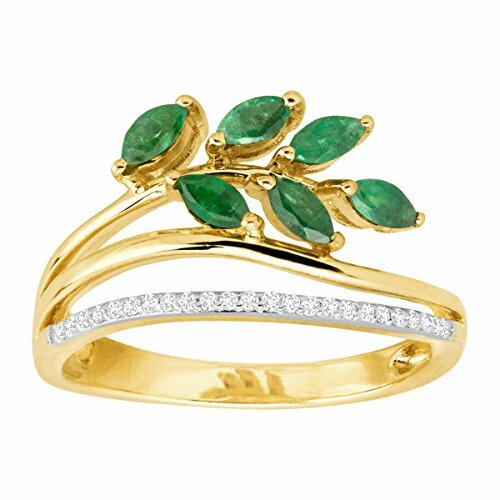 This ring showcases an elegant 7x5 mm oval emerald. Icy round diamonds surround the center stone and flow down the shank. Crafted of shimmering 10-karat yellow gold, this piece is a wonderful addition to your jewelry collection. May Birthstone. 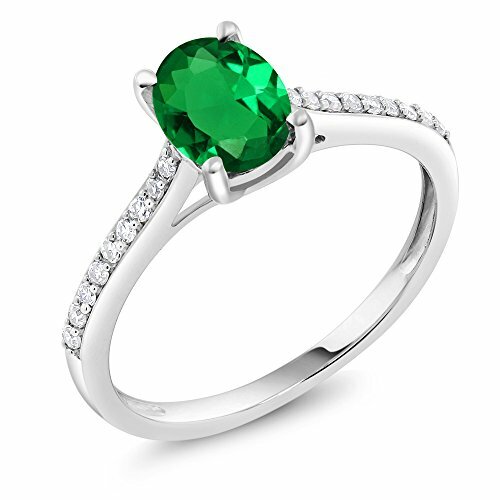 A 6x4mm genuine emerald gemstone is set between 6 sparkling white diamonds. The ring is crafted in 10K white gold. A simple, classic ring perfect for everyday wear. 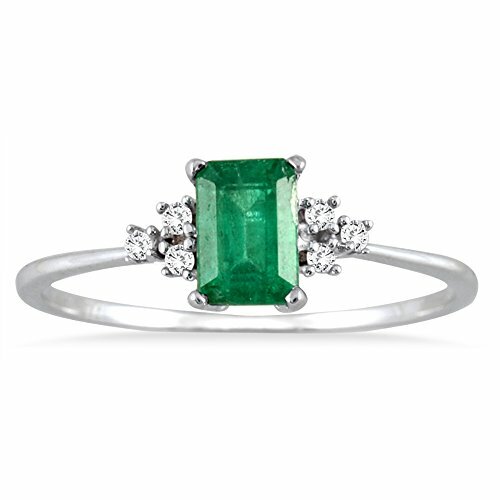 The natural emerald has a deep green color and as is with most natural emeralds, there will be some visible imperfections in the stone. A Timeless Treasure and Style Classic, our rings are always fit for any occasion. 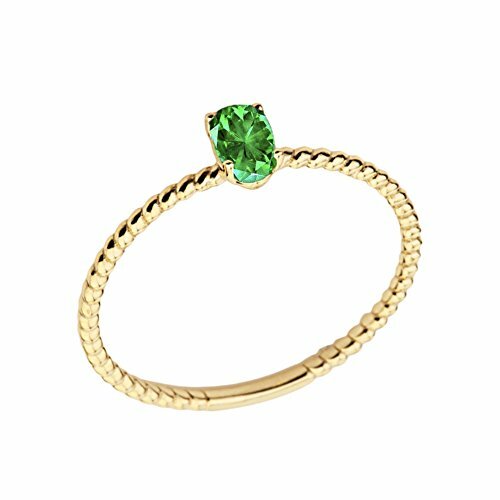 Beautifully crafted and designed our Nano Emerald, Created Sapphire and Diamond ring is sure to win your way into her heart. This ring crafted in 10K White Gold that adds a polished look to any ensemble and outfit. This ring is the perfect ring for engagements, weddings and all other occasions. As always with all of our products this item comes in packaging making it ready for gifting as soon as it is received.This beautiful item is brand new and comes with complimentary gift packaging appropriately selected to match the item you purchased. The packaging ranges from dainty foam insert packaging to luxurious leather insert cherry wood boxes. Every order is fully insured regardless of value. This insurance protects you against damage or the loss of your item while in transit. The Shipping and Handling fees include the insurance so there is no need to pay separately for insurance. A Timeless Treasure and Style Classic, our rings are always fit for any occasion. 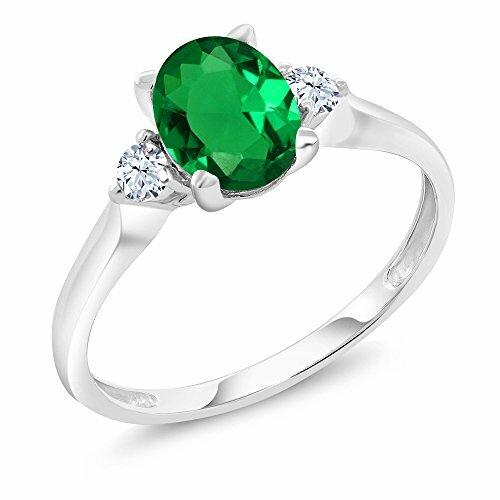 Beautifully crafted and designed our Nano Emerald and Created Sapphire ring is sure to win your way into her heart. This ring crafted in 10K White Gold that adds a polished look to any ensemble and outfit. This ring is the perfect ring for engagements, weddings and all other occasions. As always with all of our products this item comes in packaging making it ready for gifting as soon as it is received.This beautiful item is brand new and comes with complimentary gift packaging appropriately selected to match the item you purchased. The packaging ranges from dainty foam insert packaging to luxurious leather insert cherry wood boxes. Every order is fully insured regardless of value. This insurance protects you against damage or the loss of your item while in transit. The Shipping and Handling fees include the insurance so there is no need to pay separately for insurance. A Timeless Treasure and Style Classic, our rings are always fit for any occasion. 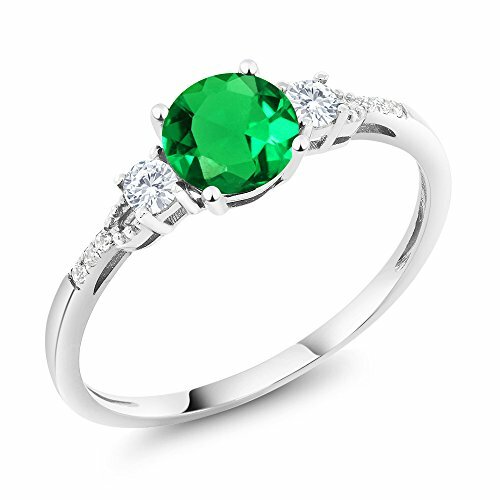 Beautifully crafted and designed our Nano Emerald and Diamond ring is sure to win your way into her heart. This ring crafted in 10K White Gold that adds a polished look to any ensemble and outfit. This ring is the perfect ring for engagements, weddings and all other occasions. As always with all of our products this item comes in packaging making it ready for gifting as soon as it is received.This beautiful item is brand new and comes with complimentary gift packaging appropriately selected to match the item you purchased. The packaging ranges from dainty foam insert packaging to luxurious leather insert cherry wood boxes. Every order is fully insured regardless of value. This insurance protects you against damage or the loss of your item while in transit. The Shipping and Handling fees include the insurance so there is no need to pay separately for insurance. 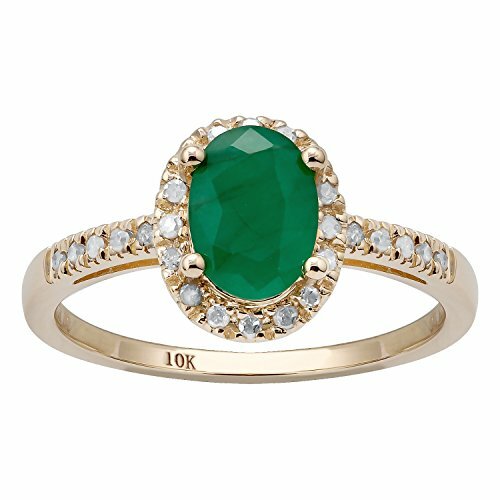 Looking for more Emerald 10k Ring similar ideas? Try to explore these searches: Blue Baby Tooth Bib, Bronze Green Apparel, and First Weather Kit. Look at latest related video about Emerald 10k Ring. Shopwizion.com is the smartest way for online shopping: compare prices of leading online shops for best deals around the web. 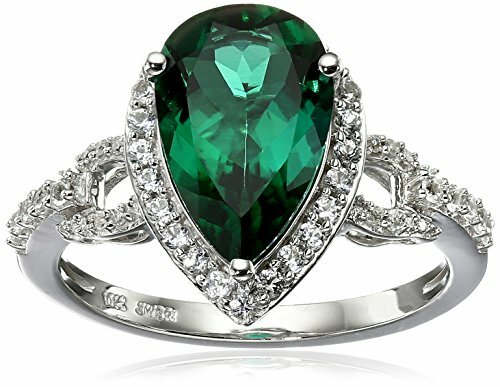 Don't miss TOP Emerald 10k Ring deals, updated daily.